This refreshing, minty, organic peppermint tea aids in digestion and gives clarity of thought. Ours is 100% pure peppermint and 100% caffeine-free (many peppermint teas are not). Fresh, pure aroma will lift your spirits and quiet your mind. Perfect after breakfast or dinner–the mint-after-a-meal custom dates back to ancient Rome, and has been a favorite cure for indigestion since Biblical times. Makes a crisp iced tea! I like spicy food. Unfortunately for me, it doesn’t really like me. After I eat something a little too spicy, I find myself suffering from some rather uncomfortable indigestion. But, I can’t let something like this stop me from enjoying the foods that I love. Having already reviewed this tea, I don’t know that I have very much more to say about it. 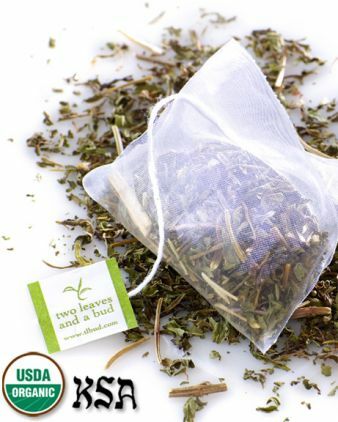 Two Leaves and a Bud haven’t changed anything about this tea – it’s still 100% pure, Organic Peppermint. This tea has no fillers and no extra unnecessary herbs. Just naturally sweet, fresh-tasting peppermint that is vibrant and alive with flavor. And that’s all that I need to get the “job” done. This not only makes a delicious hot cup of soothing relief when I have indigestion, but it is a delightfully thirst-quenching tea when iced. Pure, pristine and perfect! That’s this Peppermint to a … TEA!